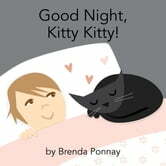 Now out-Good Night, Kitty, Kitty – Joyce's mystery and fiction book reviews with some non-fiction too! I loved this book! It is an early reader with simple language and appealing illustrations. Adults and children who love cats will enjoy watching the unnamed child and Kitty Kitty as they settle down for the night. This is a very cute read!